Remember three years ago when a “trick frame” was a Raleigh, Surly or some other 4130 frame with a Gangsta track fork? Or even just a Gangsta Track. Fast forward to today and there are dozens of fixed freestyle frames, all taking bigger tires and mega barspin clearance. 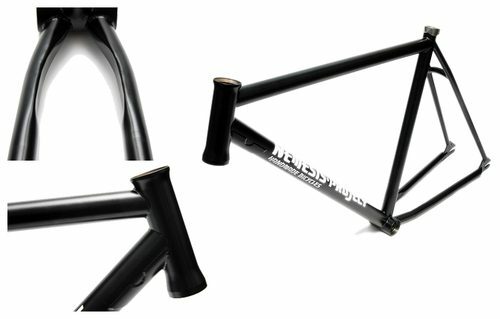 Enter the Nemesis Project Trackfighter “Plymouth” frameset. Pictured above are just a few photos and below is the description of what the Plymouth is. These are the official production photos of our affordable frame offering the Trackfighter “Plymouth” frame. Made from 100% USA made 4130 from Plymouth Mills. This frame features the proven Nem-Pro geo that changed the game in fixed gear freestyle with it’s revolutionary “reduced BB drop” Frame features include: Integrated 45×45 headset , MID BB , Laser cut gusset on the downtube at the headtube , Internally reinforced chainstays designed for grinding , heat treated laser cut 3/16″ 4130 dropouts , rounded seatstay bridge and clearance for huge tires . Frame will be hitting our dealers shelves middle of July . Check out more details at Nemesis Project’s blog.